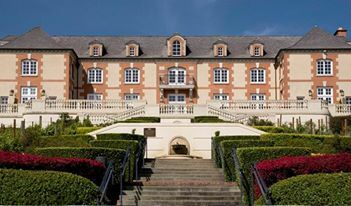 Domaine Carneros is famous for its sparkling wine and is owned by the French Champagne group Tattinger; it is certainly why California Girl and I go there frequently. We think the sparkling wine there is one of the best in the entire of Napa Valley. However, since their fizz is made from Pinot Noir and Chardonnay grapes, they also make still single varietal wines. 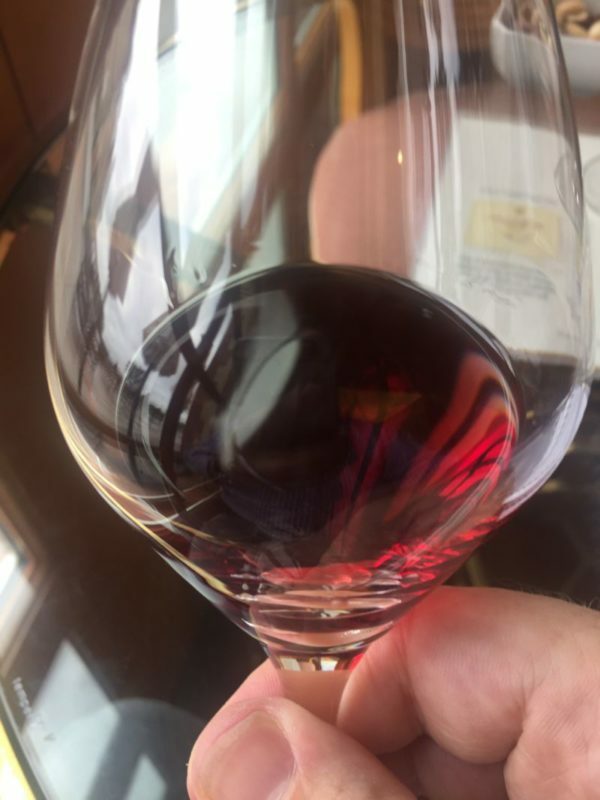 On a recent visit, I did a tasting of four of their Pinot Noir wines. California Girl sneaks in a few comments from the UK: This is one of my absolute favorite places to go and just enjoy the beauty of Napa. The sparkling wine is outstanding, the place is beautiful, and the views are wonderful. I love a good pinot noir, I really do, but every single time we go I can’t help it but skip over their pinot and stick to the sparkling wine. I am sure the pinot is lovely and good quality, I would just rather have their bubbles. 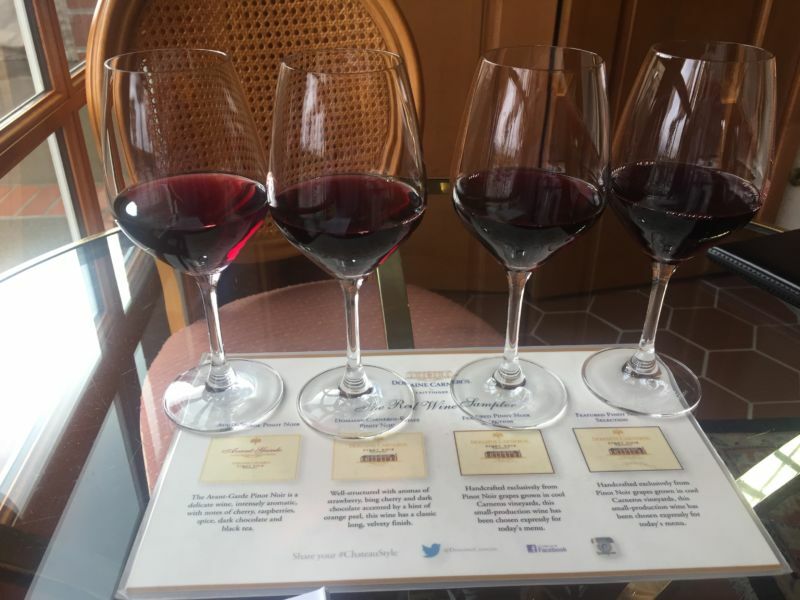 The Domaine Carneros Pinot tasting costs $24. You are given all four wines at the same time and as you can see from the pictures you get a generous pour. The wines are placed on a mat which lists the wines and provides tasting. The first Pinot was Avant Garde, which spends 10 months in 3-year-old French oak barrels. The wine sells for $26. This wine had by far the palest colour of the quartet. The nose was a subtle, but pleasing mix of cherry and spice. There was an immediate acidity that transitioned to pepper and raspberry. It lingered long in the mouth. For the price this is an excellent Pinot. Next up was the 2013 Estate Pinot Noir ($38). The had spent twelve months in two-year french oak barrels. On the nose I detected raspberry, cherry, and cocoa. It had medium acidity. The taste had a strong flavour of raspberry with a chocolate accented sweetness buried in the mix. Tannins showed themselves after the first flavours had been enjoyed. Once again their was a long finish that increased the pleasure of drinking this wine. The third was La Terre Promise which sells for $58. The nose was intoxicatingly strong and complex with cherry the most distinct note; a classic Pinot nose. The taste was raspberry, black tea, and cinnamon. The tannins were noticeable, but not in a way that was objectionable. On previous visits, this was my favourite Domaine Carneros Pinot Noir. This tasting did not change that view, but I think on balance the Estate Pinot Noir is better value for money. The last and most expensive of the wines was The Famous Gate from 2013. It costs $79. It spends fourteen months in oak; 50% in new French Oak and the other half in two-year old barrels. The nose offered plum and orange. The taste was of dark berries, orange, and pepper. The finish was dominated by tannins. It was an interesting wine, but not as enjoyable as the previous two wines. I do think that the tannins will allow this wine to benefit from a few more years. The range of prices and the different expressions of Pinot Noir make this a thoroughly worthwhile tasting. Cheese plates are also offered to accompany both Pinot and Sparkling tasting; we shall blog about those in the near future. California Girl comments: Note: This place is very popular and it requires reservations. I would suggest you get there for the first tasting in the morning or the last tastings as the views are stunning and you want to be able to relax and not feel rushed or crowded.